If you clicked on this title to read about the environmental aspects of wheelchair accessibility, sorry to disappoint, but the title is actually a play on words. This is an observation about how some people learn to create an atmosphere that invites people to connect with them. Tommy is confident but self-effacing, as well as quick-witted, warm, and, at his core, kind-hearted. I find this is true of Mark, his brother-in-law, and Vicki, his sister, too. These traits have worked in their favor as they have made many friends over their lifetime. Nine plus years ago Tommy was “gifted” with a wheelchair. I use the word gift because I have noticed that when people he meets get beyond the visual of his physical difference, they enjoy conversing with him. One of Tommy’s behaviors I have noticed that helps to ease other’s apprehension are that when he enters a space, he is usually the first to speak and smile. This intentional act informs those who don’t know him that he can speak and that he is approachable. Usually, when people begin to interact with him, they begin to relax. This is when the magic happens; when his wheelchair becomes his gift. This wheelchair accessibility, Tommy being so comfortable with himself even in this most compromised state encourages people to open up and risk being vulnerable with him. 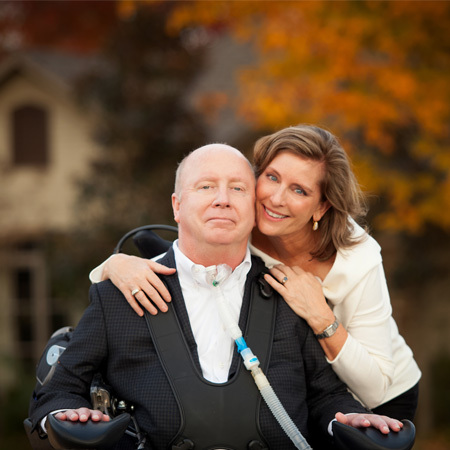 Even when he was hospitalized at Craig Rehabilitation Hospital, I would assure his friends who were going to visit him that they might feel shocked when they first see all the tubes and devices, but that after five minutes they will recognize that he is the same person on the inside as he was before his accident. Another gift from his accident is a new inner peace. Although many times Tommy feels nerve pain in his neck and head, and often his nerves make him feel very cold; he rarely complains and will even try to comfort those of us who are concerned about him. The realization that exercising these beliefs increases his happiness and decreases feelings of isolation. I believe we can all learn how to create a safe space for others if we want to, but it may take time and practice for some of us. As his wife, I am incredibly grateful to have Tommy’s example of how to turn limitations into opportunities. I have to remind myself to practice daily what Tommy has already learned. I have had to choose to embrace our changed reality, and it has not been easy. For example, instead of fretting over the many inconveniences, I try to practice acceptance which, in turn, strengthens my patience. Sometimes I conquer this and sometimes I fail miserably. My hope is that over time this discipline of mind over matter will change the way I think, feel and act toward myself and others. Our family has experienced a lot of turbulent times, but we are still here, we are in many ways stronger than before, we have received God’s love in unimaginable ways; physically, emotionally and spiritually. None of us knows what lies ahead for us; but one thing is for certain: God’s grace and love is powerful, real, and He will walk us through whatever may lie ahead if we are open and honest with Him. I encourage all of us to embrace our vulnerabilities, and instead of being ashamed of them or beating ourselves up when we fall short of our desires, allow them to soften our hearts towards others who may be struggling, whether it is physically, mentally, spiritually or emotionally. Philippians 4:6-7 ESV “Do not be anxious about anything, but in everything by prayer and supplication with thanksgiving let your requests be made known to God. And the peace of God, which surpasses all understanding, will guard your hearts and your minds in Christ Jesus. Thank you for sharing your heart and these truths! With the recent news of 2 celebrity suicides and the high number of veterans along with others who feel isolated and without hope, we must talk about the pain we are feeling that comes with being human. I pray that each of us take your words to heart and reach out to others. LET US LOVE ONE ANOTHER!!! We are so appreciative of you thank you for your encouragement and support! Thank you for sharing your thoughts, it is so encouraging to those of us on the same path! Your family is such an inspiration to our family! Thank you for taking the time to read our blogs and for commenting. Copyright © 2019 Flipped. All Rights Reserved. Web Design by Sharp Hue. Receive first-hand access to our Flipped Story content on living a full life and thriving amidst tragedy. You'll also receive our FREE guide on The 5 Ways to Triumph Over Tragedy.